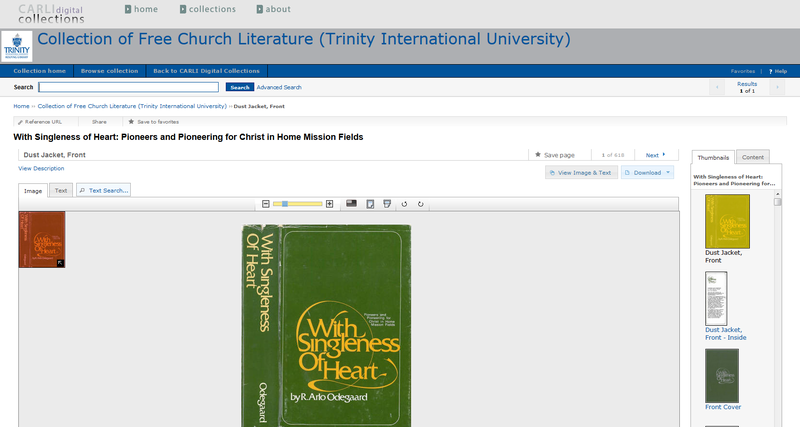 The Evangelical Free Church of America has partnered with Trinity International University’s Rolfing Library and joined the growing number of libraries across the nation in creating our own Digital Collections program. Rolfing and the EFCA digitize books, magazines, and photographs (among others), allowing you to browse, download, and share them from any computer or tablet. Digital Collections are repositories of material that have been digitized by a library or institution for wider consumption. They may include archival manuscripts, newspapers, photographs, books, or more. Trinity and the EFCA have decided that their collections will showcase the intellectual, theological, and historical legacy of the Evangelical Free Church of America and the history of Trinity. These collections are hosted through the Consortium of Academic Research Libraries of Illinois (CARLI). Their website hosts hundreds of free collections from colleges and institutions across the state, covering nearly every discipline and subject matter. You can browse CARLI’s general collections here. The homepage provides a brief introduction to the content and scope of the collection. The window pane at the right of the screen displays the most recently-added items. There are a few features here that allow you to quickly and easily access all or parts of the collection. A sample view of a digital collection’s homepage. Clicking this link immediately displays all items currently in the collection. The same function can be performed by clicking the “Browse collection” button underneath the collection title. These can be helpful in finding a specific term or word in the collection. However, it should be noted that the commonality of some words or names (e.g. Olson, Free Church) means that you run the risk of generating a lot of unrelated search results. In general, the more precise you are in your search terms, the more likely you will find what you are looking for. Putting names or institutions in quotations and using multiple search criteria (e.g. 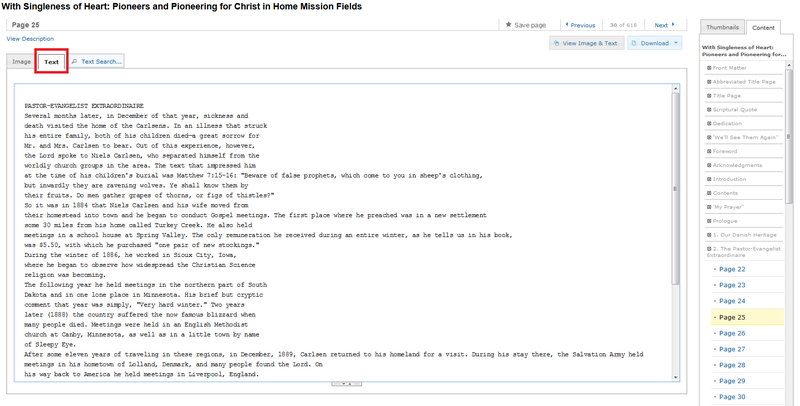 “First Free Church” AND “Rockford, Illinois”) can help in narrowing down the search results. The search works with Boolean operators, e.g. AND, OR, and NOT. These specialized criteria will display and organize material based on the term selected: e.g., “Search by Author” will display all the works in the collection attributed to that author. Each collection has its own specialized search criteria (whether it’s search by Year, or search by Author). This will bring you back to CARLI’s home page. See “Moving between Collections” below. At the Browse Collection page, you will see a few options to sort the collection. The “narrow search by” pane on the left side of the screen can further reduce the number of objects displayed by the selected criteria. However, as these criteria are automatically generated by CARLI, you may have less control over them than you would selecting a “Search By” term on the home page (such as “Search by Author”). “Display Options” and “Save to Favorites” are options for changing how the results are displayed: you can display objects as a grid, a list, or more; save to favorites allows you to save objects for later browsing. You can use the Sort By feature to arrange items. However, it has its own hiccups and may not display things exactly in order. It is useful, however, for the purposes of general organization. Above the objects you will notice a “Sort by:” feature. You can change the parameters of the search by clicking on the term, which will bring up a drop-down menu for more sorting options. The sorting options are not exact, so some items may not be in exact chronological or alphabetical order, but they nonetheless organize objects in a general fashion for easier browsing. At the top of the page is a search bar that allows you to enter in specific words or phrases to see if they are contained in the digital documents. This feature is not without its quirks, as the text-parsing functionality of CARLI software can sometimes misread words. It should be best used as a general means of seeing if certain key words appear in documents. If you click “Advanced Search,” you will have more control over the search parameters, allowing you to focus your search along a number of criteria. Using the Advanced Search allows you to use more precise parameters for searching for an object. Clicking on an object afterward should immediately bring you to where the software believes it has found the search term. In a book, clicking on the “Text” tab will display two arrows next to the object’s search bar, allowing you to go from one instance of the word or phrase to the next. In a PDF, clicking on the magnifying glass inside the PDF viewer itself will allow you to enter the term and move from match to match. After entering a search term, clicking an object should ideally locate where the word or phrase is in the document. Given the variability of text and formatting, this feature is not always consistent and perfect in its results. The Object Viewer. Note the various features found above the scanned image, and the display pane to the right of the object. The red thumbnail shows you were on the page you are currently looking; it can also be dragged around to change where you look on a particular page or image. After selecting an item to browse, you will be brought to a new screen offering various ways to read and interact with the object. Below the object will be a list of relevant data pertaining to the object (author, year, publisher, etc.). Above you can click “Previous” or “Next” to flip pages, or click on the pages displayed on the window to the right. If the object is a book or photograph (and NOT a PDF), you can move it around the screen by clicking and holding on the page and dragging it. By dragging up or down the small gray rectangle underneath an object, you can change the size of the viewing window. You can zoom in or out of the document either by clicking + or -, sliding the blue square back and forth, or clicking on a space in the yellow bar itself. Clicking this will make the document take up the entire window, showing it side by side with a text transcription of document (where applicable). This will make the page automatically zoom in or out to fit the size of the viewing window. You can change the size of the viewing window with the gray slide rectangle underneath an object. This will zoom the page or image to make it fit the width of the object viewer screen. Clicking these rotates the page or image appropriately. Above the Object Viewer are several more display features. Selecting Image or Text will display the scanned object or a text transcription of the page, respectively. Text Search will attempt to locate and highlight words or phrases within the document. Sometimes the search feature works best while viewing the object as Text and not Image. A View of the Text transcription of an object. Text search works best in this format, as it brings up the arrows that allow you to go back and forth between search hits. Clicking the “Image” tab while a term is highlighted will display the page that text is located on. 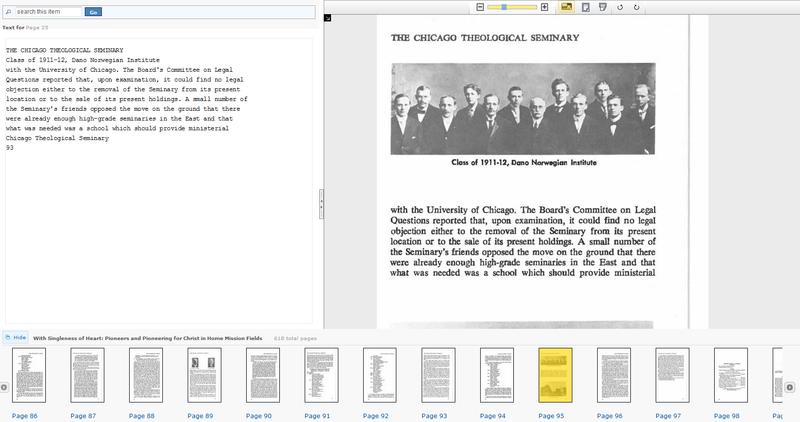 Like clicking on the “Full Browser” option, this will simultaneously display the scanned page and the transcription side by side. This offers multiple download options for either downloading a single page or image at various sizes, or the entire object as a PDF. Located to the right of an object, this window shows the pages and structure of a book. By default they are set to Thumbnails, which displays a preview image of each page. Clicking on a thumbnail will bring you to that page. Clicking on the “Contents” tab will switch to revealing the structure of the book. 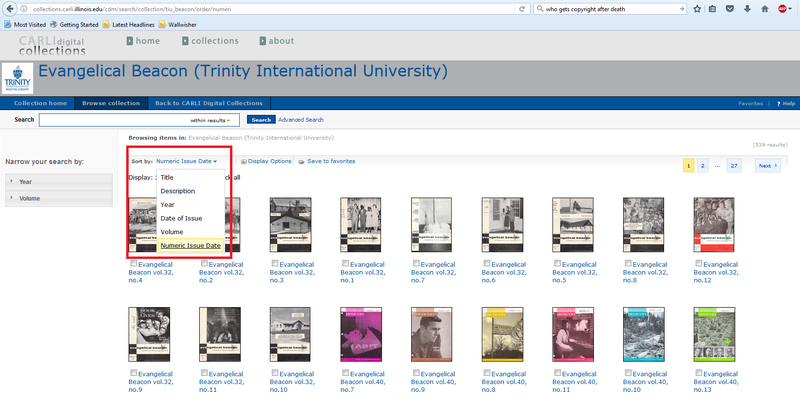 This can be used to locate chapters or sections of a book you are interested in, and is a very useful and powerful feature of the Digital Collections. The display option window on the “Contents” tab. Note how instead of thumbnails, the chapter format of the book is now on display. You can “open” a chapter and jump to any particular page easily in this arrangement. PDF display is slightly different than that of books and photographs. Depending on the size of the PDF, they will be displayed in two different ways. If the file size is small enough, PDFs will be viewed through an in-browser version of Adobe Acrobat Reader hosted by CARLI. Its functions are identical to the way in which you browse PDFs on your computer. If the PDF’s size is too large for CARLI to display, it will instead show an icon that, on clicking it, will prompt you to open up the PDF natively on your own computer. 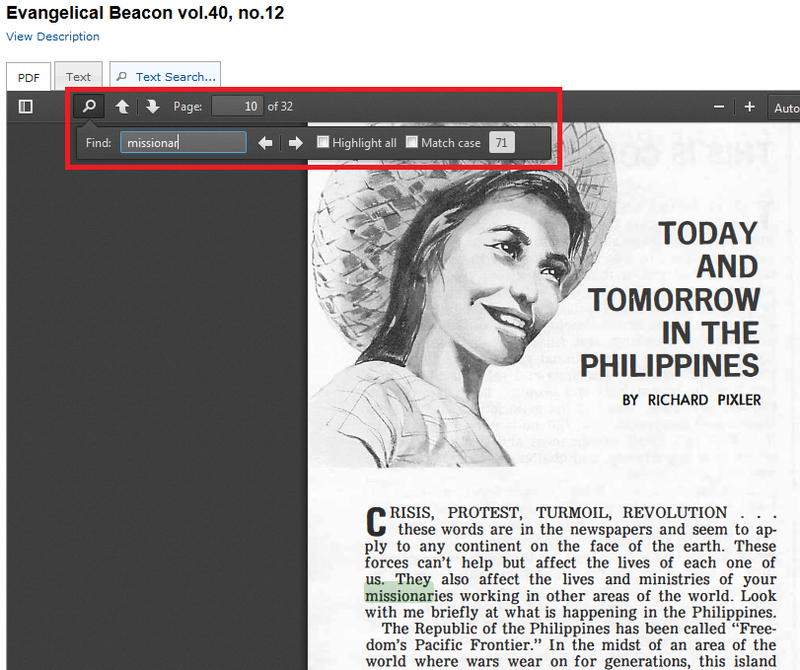 The “Text Search” feature has trouble working within PDFs displayed on the browser. However, you can click on the magnifying glass inside the pdf to have an accurate search tool. 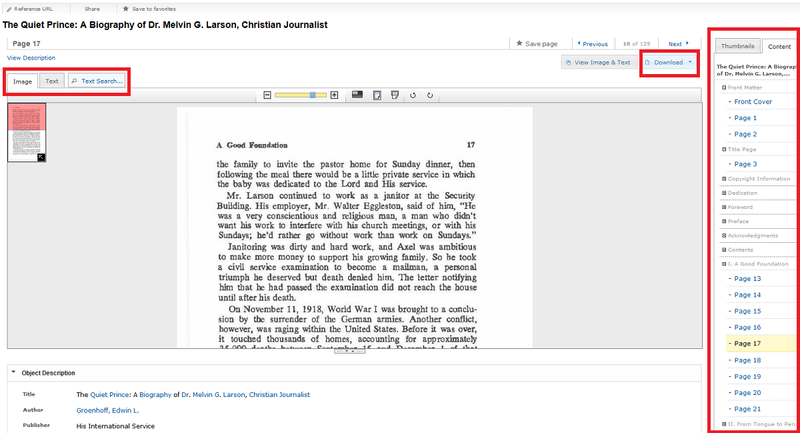 A View of the PDF reader built into the Digital Collections platform. Note the PDF-specific search and viewing tools above the document itself. The left and right arrows to the right of the search bar allow you to jump from match to match. If you are working in one collection and want to move to another, there are a few ways to do so. An easy way would be to have different collections open in different tabs on your browser of choice. CARLI allows you to find collections through its homepage. 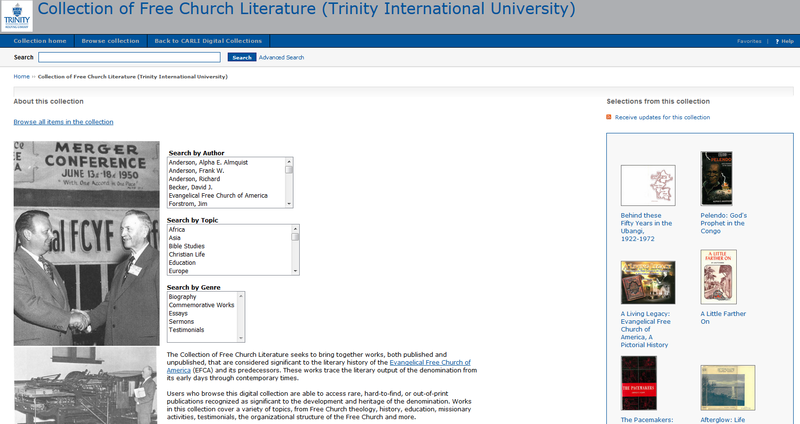 From there, note the selectable queries at the bottom of the page: “by name,” “by topic,” “by media,” and “by institution.” Selecting “by institution” will show you a list of CARLI members with digital collections. 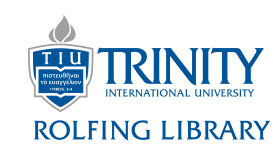 Selecting Trinity International University from this list will bring up all of its collections. 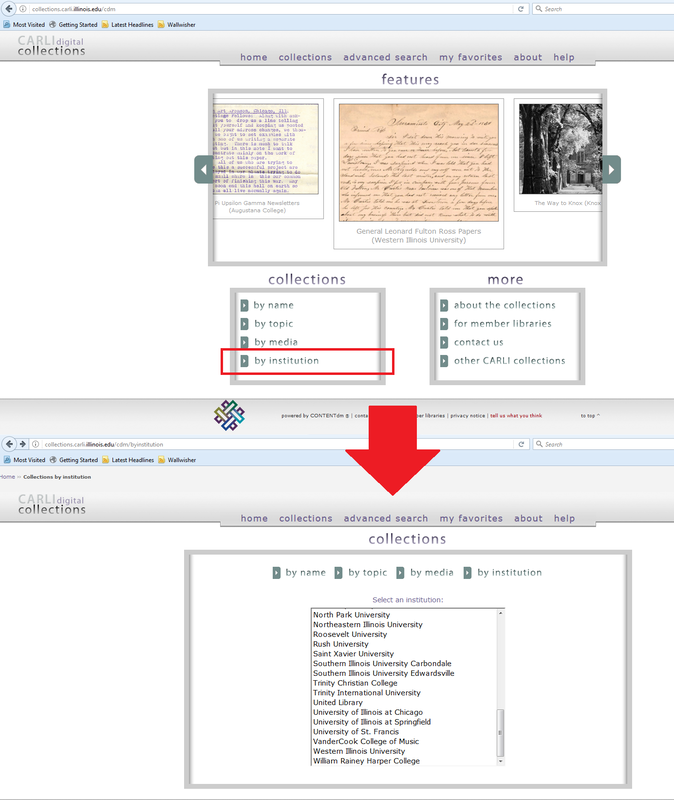 CARLI’s digital collections homepage, and the list displayed when selecting “by institution” under its collections tab.